The desktop computing market as a whole has been subject to severe challenges over the last few years. The ultra-compact form-factor (UCFF) PC market that emerged with the introduction of the Intel NUCs (Next Unit of Computing) has been one of the few bright spots. PC gaming has been one of the few other markets that has withstood the overall issues. The small size of UCFF PCs usually made discrete GPUs difficult to integrate, and iGPUs have not impressed the gaming crowd. Therefore, the market has not seen many products targeting the gaming market while also being compact. This year, we have a new entrant in that category - Intel's Skull Canyon NUC, the NUC6i7KYK, places a 45W TDP Core i7-6770HQ with Iris Pro graphics in a chassis around twice the size of the standard NUC. In the course of our coverage of mini-PCs, we have seen offerings from vendors such as ASRock, GIGABYTE and Zotac targeting the gaming market. Usually, 'mini' doesn't fit the requirements of consumers in this space, but the appearance of power-efficient high performance GPUs have made the offerings in the gaming mini-PC space quite interesting. The Intel Skull Canyon NUC6i7KYK aims to go one step further by taking the discrete GPU out of the equation and reducing the size of the system as compared to the ASRock VisionX and Zotac ZBOX E-series units. Skull Canyon has a slightly bigger footprint compared to the traditional NUCs, coming in at 211mm x 116mm x 28mm (compared to the 115mm x 111mm x 32mm of the NUC6i5SYK). 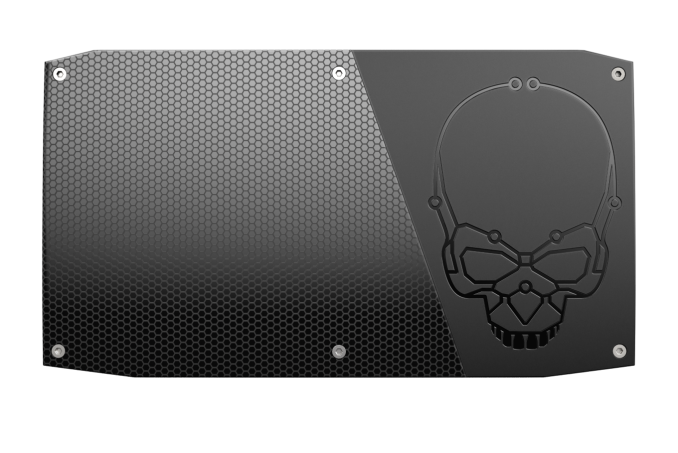 Unlike the plain industrial design of the traditional NUC chassis, Skull Canyon goes for slightly more stylish design. The default lid comes with a skull logo on top (Intel's products targeting the gaming market have traditionally included that logo), though the package also includes a lid without the logo. Additional items in the kit include a VESA mount and screws for the same, as well as a 120W (19V @ 6.32A) power brick with a separate power cord. A quick-start manual provides directions on how to add memory and SSDs to the unit. Intel provided us with an engineering sample of the NUC6i7KYK with DDR4 SODIMMs and a M.2 SSD pre-installed. The specifications of our review unit are summarized in the table below. The Intel NUC6i7KYK (Skull Canyon) kit doesn't come with any pre-installed OS. Our evaluation was done with Windows 10 Pro x64, with all the latest patches installed. All the drivers, except for the GPU, were downloaded off the Skull Canyon product page. The latest GPU drivers for the Iris Pro Graphics 580 were downloaded from the GPU-specific page. The gallery below shows the various features of the chassis as well as the teardown pictures for lid replacement / memory / SSD installation. Important aspects to note in the above pictures include the USB 3.0 header visible in the opening beneath the top lid (perfect for third-party lids to take advantage) and the WLAN antennae glued to the top on the front side. It is heartening to see Thunderbolt back after its first and only appearance in the first-generation NUC. The dual M.2 slots are also interesting, and this brings us to the next topic - the board layout. The NUC6i7KYK uses a Skylake-H CPU in conjunction with the H170 platform controller hub (PCH). The board layout (how the various I/Os communicate with the CPU) is shown below. Of particular interest is the placement of the M.2 slots and the Alpine Ridge Thunderbolt 3 controller. It is good to see that the SDXC slot is enabled by a PCIe SD card controller (PCIe x1), and not via a USB 2.0 bridge. Intel specifies support for UHS-I speeds. The two M.2 slots are off the PCH. This is understandable since the SATA links that must be multiplexed with the PCIe lanes are going to come off the PCH and the high-speed I/O lanes are shared. 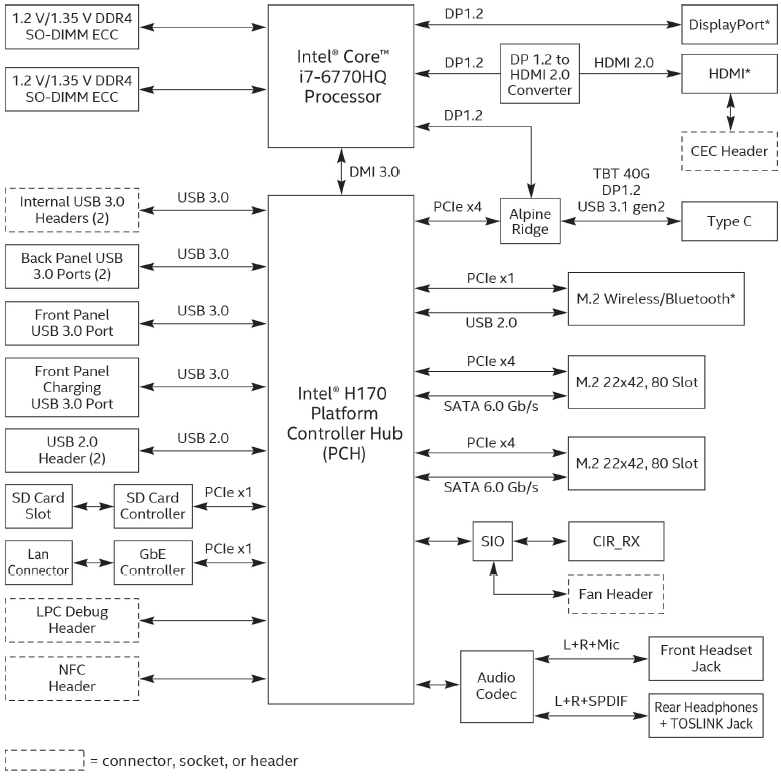 The disappointing aspect here is that the Alpine Ridge controller hangs off the PCH, and not the CPU. Given that a dGPU can only be attached to the system via the Thunderbolt 3 port, it would have made sense to connect it direct to the CPU. This also means that all the high-speed peripherals that can be attached to the NUC6i7KYK are bottlenecked by the DMI 3.0 link between the CPU and the PCH when it comes to exchanging data with the CPU. 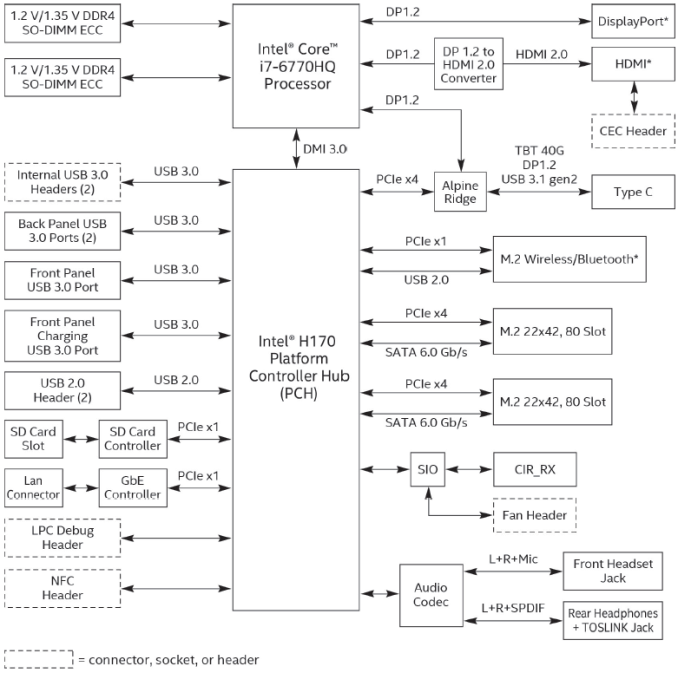 In the Skylake-H / H170 setup, this link is effectively PCIe 3.0 x4 in terms of bandwidth. Moving on to the BIOS features, the gallery below presents some screenshots of Intel's VisualBIOS for the NUC6i7KYK. The important default setting to note is that the performance mode is set to 'Balanced Enabled'. Other options include 'Low Power Enabled' and 'Max Performance Enabled'. The user interface as well as other settings are quite similar to what we saw in the Skylake NUC review, except that the Skull Canyon BIOS has settings specific to the second M.2 slot and the Thunderbolt port. In the table below, we have an overview of the various systems that we are comparing the Intel NUC6i7KYK (Skull Canyon) against. Note that they may not belong to the same market segment. The relevant configuration details of the machines are provided so that readers have an understanding of why some benchmark numbers are skewed for or against the Intel NUC6i7KYK (Skull Canyon) when we come to those sections. What work do you want to do on a 45W mobile quad with (albeit high end) integrated graphics, that needs ECC? All of the cache in Intel CPU's is ECC anyway. Chances of errors not being corrected by bad information pulled from system RAM is rare (16e^64) in consumer applications. ECC was more important when there was a small amount of system RAM, but these days with the amount of RAM available, ECC is not only less effective but less necessary. @TeXWiller: "The larger the array the larger target it is for the radiation to hit."